Biltong is still new to US consumers, and many who have tried and tasted it simply compare the product with jerky. But let’s face it: Biltong is not “jerky” made with South African recipes. It is a standalone category that appeals to nutrition food eaters. One of its main US purveyors has trademarked it thus: “What jerky wants to be”. Sports nutrition veterans, Ted Casey and Joe Oblas, have been working to bring biltong to the mainstream US market ever since they started Stryve Foods, currently the largest biltong manufacturer in the country, back in 2017. “When we found biltong, we knew it was a much better product to the consumer,” said Casey, who is now the chairman of Stryve Foods. “The recipe and the process we use originated in South Africa hundreds of years ago, and our factory in Oklahoma is one of the few licensed plants that are allowed to produce biltong,” since importing biltong from other countries is prohibited by the USDA. The main difference between the two products is that biltong is air dried, rather than heated. Also, it isn’t soaked in a sugar-based marinade before the drying process, according to Casey. “The environment we created for the air-drying process is like a hospital room: It’s a very sterile environment with humidity and temperature controls,” he said. 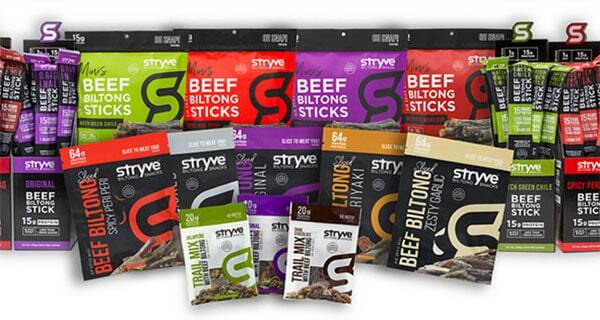 Stryve Foods currently produces a variety of sliced biltong flavours, including original, zesty garlic, smoked and teriyaki, and they are available in both mass retailers, such as Jewel Osco, as well as nutrition stores, including GNC and The Vitamin Shoppe. After nearly two years into business, Oblas said the Stryve brand is increasingly being recognised by the mainstream US shoppers. Stryve Foods started by self-funding, and the increasing market demand for biltong helped the company receive $10-million funding from multiple investment companies, including Meaningful Partners and Murano Group, in September last year. “The [meat snacks] category continues to grow rapidly. The industry has surpassed $3-billion in the US now, and it’s growing faster than any other salty snack categories,” Casey noted. Most of the funding has been used to build the Oklahoma factory and to further expand its market footprint, but the biltong brand will raise another $10-million investment in less than two weeks. “We achieved just over $7-million in total revenues for our first full-year, and our goal for 2019 is to be in excess of $30-million with around $8-million capital being spent in marketing,” Casey said.